Directorate of Technical Education (DTE), Maharashtra is to publish the CAP 2nd round allotment details today, 8th August. Candidates waiting for DTE Maharashtra 2nd allotment results 2018 can download from the DTE Maharashtra official website, dtemaharashtra.gov.in. Candidates waiting to get admission in Post SSC diploma in engineering and technology/ Polytechnic can check the result of provisional allotment. The DTE Maharashtra has displayed the merit list of selected candidates on 21st July. Now, the aspirants who got shortlisted in the merit list can check the allotment results (1st Round). Candidates who have applied for Diploma admission can check the Second round allotment details from the official website, dtemaharashtra.gov.in. Candidates who do not get admission in 1st round can get admission in the next rounds. The Department of Technical Education Maharashtra has accepted applications for admissions of Post SSC diploma in engineering and technology/ Polytechnic courses. A huge number of hopefuls seeking admission in Maharashtra DTE have applied for the admissions. The DTE admission will be done through Centralized Admission Process (CAP). Under this system, students will have the chance to select their interested colleges/courses. The CAP process has been done and also DTE Maharashtra has already published the merit list on 21st July. Now, the aspirants can proceed to check the DTE Maharashtra Post SSC Diploma provisional seat allotment result. Candidates who got allotted the admission can download the allotment order from the DTE Maharashtra portal. More information regarding Post SSC Diploma/Polytechnic admissions is mentioned below. Candidates allotted admission in DTE Maharashtra CAP 2nd round allotment can download allotment order to report at the allotted colleges. Candidates have to pay the requisite admission fee to join the college. Students can lock the option they have allotted or if the students seeking for any other college they can wait till the next rounds of seat allotment. The DTE Maharashtra Diploma CAP 1st round allotment schedule was mentioned here. How to Check DTE Maharashtra Post SSC Diploma 2nd Round Allotment Results 2018 Online? Search for the ‘Post SSC Diploma Polytechnic CAP 2nd round allotment list 2018’ link on homepage. Click on the link and provide the details of registration number and password. 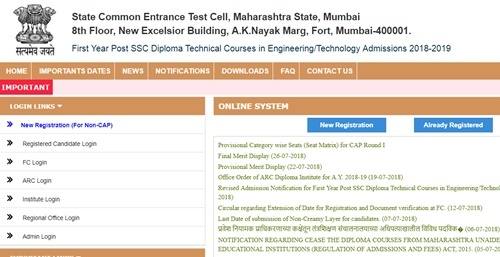 The DTE Maharashtra Polytechnic/Diploma 2nd allotment list appears on the screen. Check it and take a printout of the allotment order to report at the allotted college.